CLEVELAND (AP) — Bryn Forbes scored 27 points to lead Cleveland State to an easy 97-72 win over Notre Dame College on Wednesday. Forbes hit 10 of 16 shots, including 5 of 10 3’s, for the Vikings (6-5). Marlin Mason added 15 points, Sebastian Douglas 13 and Trey Lewis 10 for Cleveland State, which shot a blistering 61.4 percent. Tyree Gaiter had 24 points for the Blue Falcons (3-7). Notre Dame stuck with the home team for a half with Gaiter’s 3-pointer tying it at 37 1:39 before the Vikings scored the last four points. The Vikings stretched the run to 10 to go up 47-37 but they didn’t shake the Blue Falcons until a 9-0 run pushed the lead to 67-49 with 12:09 to play. The lead reached 33, 92-59, on a Forbes 3-pointer, with 5:15 remaining. 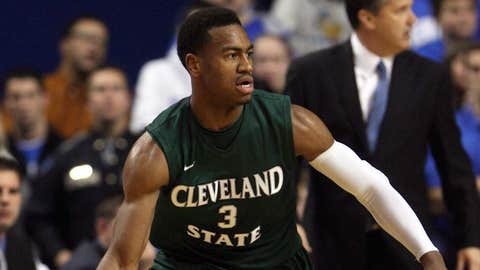 Cleveland State guard Trey Lewis chipped in 10 points for the Vikings on Wednesday night.